Are you 100% ready to sell your home/condo? Are you 100% ready to price your home/condo competitively to allow it to sell? Are you willing to prepare the propertyto be shown? Are you willing to make the house accessible by having a lock-box installed to allow agents access to show prospective buyers your home at reasonable times? Selecting a Realtor ® is an important decision, as important as selecting a doctor or attorney. Your Realtor is responsible for keeping your best interests in mind at all times, advising you and counseling you every step of the way. The first 3 to 6 months is by far the most important stage of selling your property. If it does not sell there is only two solutions reduce the price significantly or do some major curb appeal remedies. First and foremost your Realtor ® or Team of Realtors ® must have your confidence and trust which creates the highest form of fiduciary relationship. Remember, it is prudent to be cautious with persons requesting “up front” fees. Most Realtors ® derive their income through commissions, and doing their absolute best for you, insures their commissions and future referrals. As your selling agent we fully understand the motivations and strategies of other buyers and agents who do not represent you. 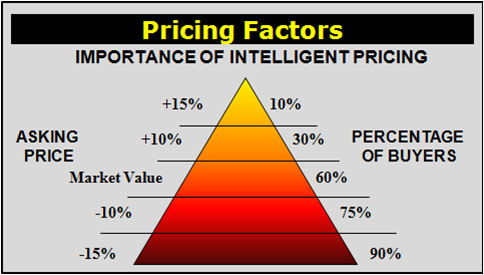 Our goal is to provide our clients with the knowledge to understand pricing and the sales process and procedures. This approach shifts the leverage in our favor and outlines a clear strategy in dealing with potential buyers/ buyers agents. Our goal is to sell your home in the fastest most profitable manner, and to exceed your service expectations. 1. We will carefully listen to your needs, desires and expectations for the sale of your home or property. 2. We will provide you with current market values, conditions, and trends that may affect the sale of your home or property. 3.We will put together a Marketing Plan for your property. As part of the plan we provide instant, extensive Internet exposure,Latitude 34 Realty® advertises on over 62+ Real estate industry web sites. We utilize MLS & IDX giving you exposure to over 5,000 Realtor websites.We will install Latitude 34 signage, an information box with information sheets and a secure traceable Lock-box system. 4. We schedule and coordinate all negotiations, inspections, surveys, showings, feedback, mortgage qualification verifications, communicate and cooperate with all other professional agents and customers as needed. The most important piece of the puzzle is competitively pricing your home. You want to attract the largest potential pool of buyers. This critical piece will be discussed at our first meeting. Someone from the team will go through your house with you, and possibly make recommendations on how you could make your home more attractive to prospective buyers. A secure, monitored lock-box should be placed with the residence, to allow professional agents to gain access to view and show the property. *Our agents will immediately install an eye-catching Latitude 34 Showcase sign on your property when allowed. It should be on front of property with initial information sheets. An ample supply of color Internet brochures should be kept in the house. Internet Advertising of your home on OurWebsite, the MLS, Realtor.com (#1 Traffic Site), Trulia.com, Zillow.com and 62 + other National Real Estate Sites with high ranking in the major search engines like Yahoo, Google, MSN, AOL and more. MLS entry with full details and pictures. This step gives your property exposure on over 5,000 agent web sites! It is essential that Agents have the ability to find your listing in the MLS and thousands of websites that receive data feeds from the MLS when searching for properties for their Buyers. Professional, full color Property Flyers and Brochures distributed to specific target markets and areas. Networking with and advertising your property to other Agents—locally. Public Open Houses to market your home to prospective Buyers for maximum exposure. Over 80% of the properties sold are found on the Internet!! We will show your property to all prospective, “Qualified” buyers not represented by an agent. (We would also refer all prospective buyers to a trusted ethical lender/mortgage broker). With coastal properties connecting the Buyers to the right Lender is often the difference between a sale and no sale. We have taken perspective buyers who having attempted and failed on a purchase, and matched them up with a property and the RIGHT lender and made a successful transaction on numerous occasions. We will provide assistance, guidance and counseling throughout the entire marketing, negotiating, and closing of the property. We will facilitate scheduling and coordination of all closing activities/inspections/appraisals. Your agent should provide regular follow-up feedback information on showings. The quickest way to sell a property is to work closely with your agent. Each should have the others cell # and use it anytime there is a question or an offer. The Latitude 34® team does not ask for up front Marketing Fees unless the client requests unusual or extravagant marketing strategies outside the realm of our basic high quality marketing already in place as above. Our Team ® strives to maintain a program unmatched by the majority of real estate companies and in doing so “invests” time, money, supplies, expertise in providing a service that will result in a positive outcome for you. Remember, we only get paid if we get results for you. Thank you for your time. The on-line delivery on the listing presentation is new and is designed to save you time in selection of your listing company. Hopefully you found this informative.